DAVAO CITY, Philippines (Mindanao Examiner / Mar. 3, 2011) - Relatives of five journalists murdered in Mindanao will file their complaints Friday against the Philippine government before the United Nations Human Rights Committee, their legal representatives said. Attorneys Harry Roque and Romel Bagares, of CenterLaw, Philippines, said the murdered journalists Juan Pala, Fernando Lintuan, Dennis Cuesta, couple Maricel and George Vigo, and William Yap Yu, were all killed in separate instances across a time span of 8 years, from 2000 to 2008. They said none of their families have seen justice for these murders, due to a combination of non-existent or botched investigations, and failures to ever bring cases before the courts. In the case of Cuesta, the only identified suspect in his murder - a high ranking police officer with connections to the local mayor in General Santos City – has managed to evade arrest since the crime in 2008. But the suspect, while at large, had somehow managed to file court submissions through his counsel. In their 5 communications, each running to around 30 pages, the families alleged breaches by the Philippines of their loved ones’ rights under the International Covenant on Civil and Political Rights (articles 6, 19, 25 and 26). The families are utilizing the ‘Individual Communication’ procedure under the First Optional Protocol to the Covenant to file their complaints. The lawyers said the families of those killed hope that the five communications will be considered by the HRC jointly as a series.If successful, the families hope to be awarded damages for the government’s failure to bring the perpetrators of these murders to justice. Roque said the woeful response by the Philippines to these murders has contributed to the impunity for media killings in the country, culminating in the tragic Maguindanao massacre of 2009; “It is not surprising that we’re ranked by the CPJ as the third deadliest country in the world for journalists to work in – and what is the government doing to address this issue? What has it done for these families?” he asked. 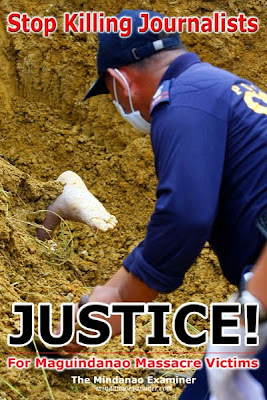 Maguindanao massacre refers to the brutal murders of 57 people, including at least 32 journalists, allegedly carried out on orders from the powerful and influential Ampatuan clan. Clan members denied the accusations against them.